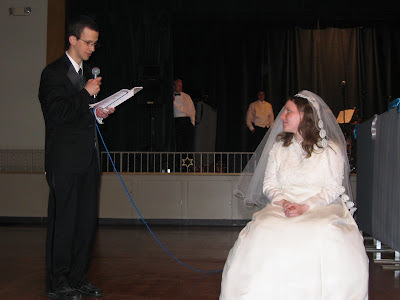 Here's a picture of Shmuel singing "Aishes Chayil" to me at our wedding. "Aishes Chayil" is a song that most men sing to their wives on Friday nights, and many sing it at the wedding reception too. The bandleader at the wedding said that it was the sweetest rendition of the song he had ever heard. Elana, that was a beautiful photograph indeed!!! I am so happy that you had fun at the wedding, and I am so glad that you are so nicely on the weight-loss path. And oh, teacher....I am in the pursuit of zara chaya v'kayama. beautiful. I love the look on your face!